Registration of professionals and the PRC license renewal have plenty of steps. Aside from that, Filipino professionals had to fill-out many forms and submit a lot of documents. This means that the probability of error is great. 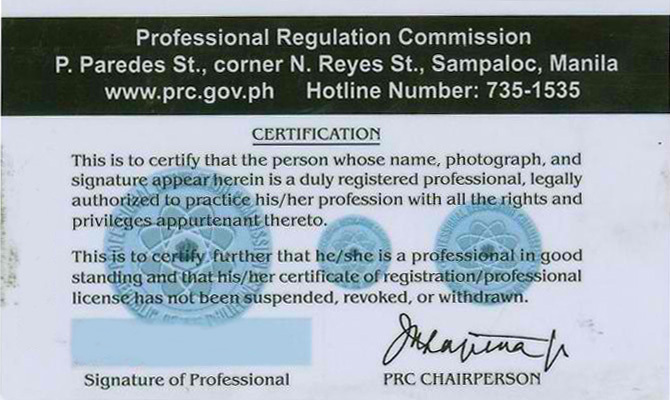 It is not surprising that some PRC license received by Filipino professionals have incorrect information. Good thing that the Professional Regulation Commission (PRC) corrects wrong information on the PRC license. Filipino professional can do the correction by making a petition for correction of entries/ data. 1. PRC Petition Form, which is officially known as PRC SRB Form No. 0002. You can download the form here. 3. Money for payment of fees. You should also bring your PRC license (PRC ID) and the documents that support the correction that you are petitioning. For correction of your name or for the correction of birth date you must bring the following supporting documents: NSO Birth Certificate, Marriage Certificate from the National Statistics Office (for married Filipino professionals only), and personal affidavit. For the reversion to maiden name and change of legal status due to death of the spouse, annulment of marriage, and the presumptive death of an absent spouse; you must bring the following supporting documents: NSO birth certificate, NSO death certificate (in case of death), Certified copy of the court's decision (in case of annulment or presumptive death), and certificate of finality or entry of judgment (in case of annulment or presumptive death). For the change of married name to another married name due to remarriage you must bring the following supporting documents: NSO birth certificate, NSO death certificate (in case of death), Certified copy of the court's decision (in case of annulment or presumptive death), and certificate of finality or entry of judgment (in case of annulment or presumptive death), NSO certificate of marriage of the latest (subsequent) marriage. 1. Fill-up the PRC petition form. 2. Proceed to Registration Division at the ground floor of the PRC Central Office main building for verification of your registration. Teachers should proceed to the Office for Professional Teachers at the 3rd floor of the PRC Central Office annex building. Marine Deck and Engineer Officers should proceed to the Marine Deck/Engineer Division at the 4th annex building. 3. Proceed to the Records Section the ground floor of the annex building for the verification of examination records. 4. Pay fees at any of the cashier windows in the PRC Central Office and obtain the official receipt. 5. Proceed to the Customer Service Center for the notarization of your petition and pasting of documentary stamp. 6. Submit duly accomplished PRC Petition Form to the PRC Regulations Office at the 2nd floor of the main building together with the official receipt and other required documents. Note: These procedures are only applicable in the PRC Central Office at P. Paredes St. cor. Morayta St., Sampaloc, Manila. Do you want to know how to change the name on your PRC License due to marriage? Read this blog post. Also read my tips for PRC license renewal. If I need to change from a married name to another married name ( option #9 in the form), what name should I indicate in the first line of the form (the "I ___________, of legal age..."), is it my maiden name, my previous married name or the current married name? Thanks. Hi! LET Passer ako last 2015. Release ng PRC License ko was Feb 2016. Di ko pa kinuha that time dahil inasikaso ko na yung wrong spelling sa surname ko and at the same time para sana iisang lakaran na lang pag nagpabago ako ng surname at pagclaim ng license. Nandun pa po kaya yun or maipapabago ko ba yung correct spelling ng surname ko kahit di ko pa naclaim yung lisence ko? Thanks. Sa tingin ko ay wala na yung license mo since di mo kinuha. Lagpas three months na kasi. Hi! Criminology passer po ako. Gusto ko lang malaman if pwede po ba ma e correct spelling yung middle name ko. Kasi nakalagay sa PRC license ko (At-at) at dapat sana (Atat).Thank you and hoping your favorable response. Pwedeng pwede nyo pong ipa-correct yan. Please go to the PRC to correct your license. magkano Sir ang payment pag nagfile ng correction?